HAVE you been to Wuffalo Will's Wild West of recent times? 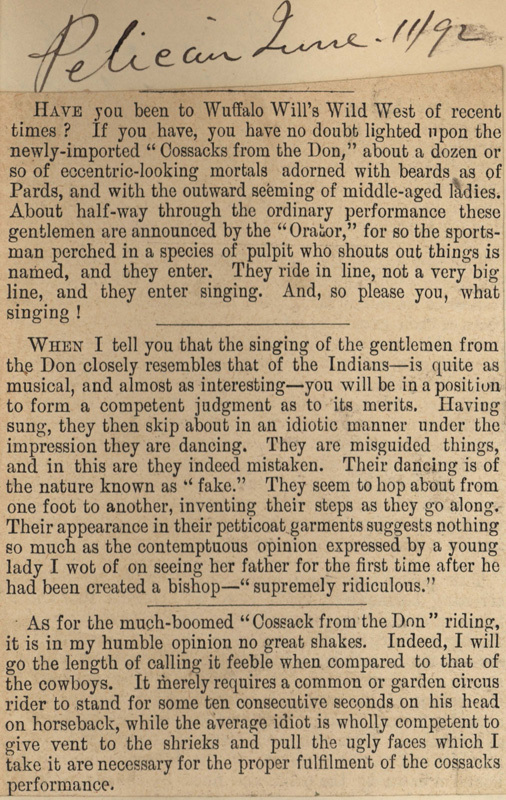 If you have, you have no doubt lighted upon the newly-imported "Cossacks from the Don," about a dozen of so of eccentric-looking mortals adorned with beards as of Pards, and with the outward seeming of middle-aged ladies. About half-way through the ordinary performance these gentlemen are announced by the "Orator," for so the sportsman perched in a species of pulpit who shouts out things is named, and they enter. They ride in line, not a very big line, and they enter singing. And, so please you, what singing! 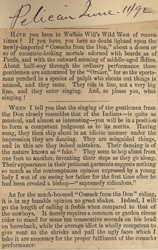 WHEN I tell you that the singing of the gentlemen from the Don closely resembles that of the Indians—is quite as musical, and almost as interesting—you will be in a position to form a competent judgment as to its merits. Having sung, they then skip about in an idiotic manner under the impression they are dancing. They are misguided things, and in this are they indeed mistaken. Their dancing is of the nature known as "fake." They seem to hop about from one foot to another, inventing their steps as they go along. Their appearance in their petticoat garments suggests nothing so much as the contemptuous opinion expressed by a young lady I wot of on seeing her father for the first time after he had been created a bishop—"supremely ridiculous." As for the much-boomed "Cossack from the Don" riding, it is in my humble opinion no great shakes. Indeed, I will go the length of calling it feeble when compared to that of the cowboys. It merely requires a common or garden circus rider to stand for some ten consecutive seconds on his head on horseback, while the average idiot is wholly competent to give vent to the shrieks and pull the ugly faces which I take it are necessary for the proper fulfillment of the cossacks performance.